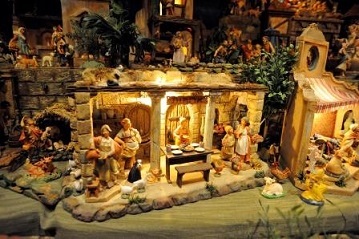 Take a step back in time to when Christmas was simpler at Old Sturbridge Village. Currently in its fourteenth year, OSV’s Christmas by Candlelight celebrates beloved New England holiday traditions against the backdrop of one of the region’s preeminent living history museums. Activities range from strolling carolers and rides in a horse-drawn carriage to an annual gingerbread house contest and a roaring bonfire, all of which infuse OSV’s educational aims with holiday fun. “There are decorations everywhere,” Simmons says. “Visitors have an experience.” In each historic house, costumed historians offer peaks into different Christmas traditions, like music or a traditional holiday drink called wassail. 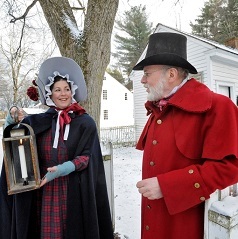 Christmas by Candlelight is an integral part of Old Sturbridge Village’s broader interpretational program. “It’s all about traditions. People like to know where things come from,” Simmons says. “We use the village as a set—it has a magical way of immersing people fully, engaging them in whatever we’re doing.” Year-round, Old Sturbridge Village offers visitors the chance for hands-on learning, whether that is playing traditional games, exploring historic buildings, or asking questions of OSV’s historians and artisans. Old Sturbridge Village offers a rare glimpse of New England’s history from a perspective left out of most history books. For Simmons, that is one of the most rewarding things about working at OSV.